In case anyone is wondering what happened to Chris Finill, he was tripped after 3.5 miles, fell badly, broke his humerus (upper arm bone and not at all funny) in two places, stopped for 5 minutes for St John’s Ambulance people to strap him up and feed him pain killers and still finished under 4 hours! Then in hospital until 11 p,m that night... But he is still an Ever Present! Who on earth are these people?... what is this Web site about? 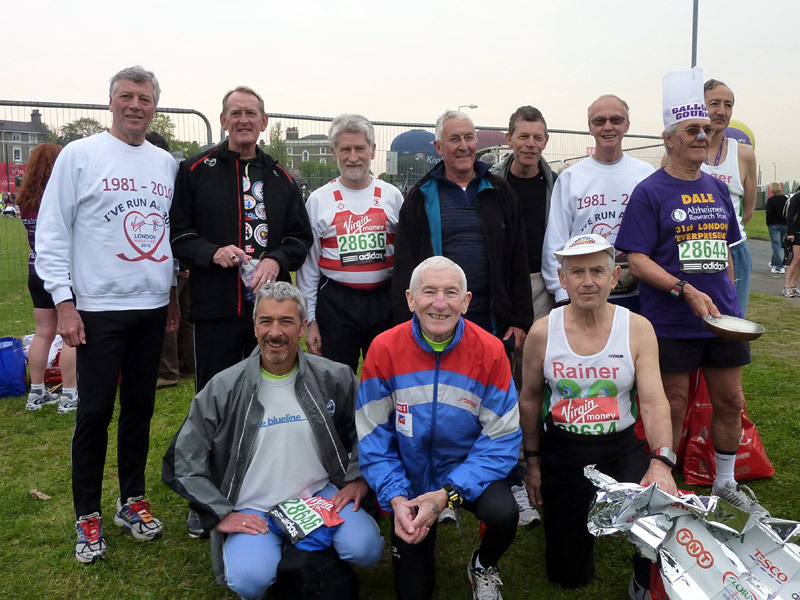 They are a body of men whose common denominator is the London Marathon. 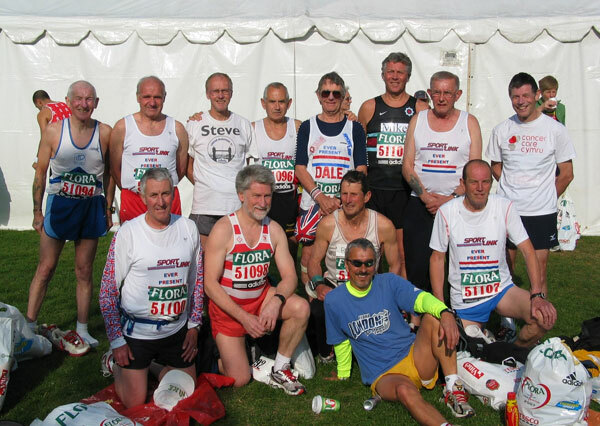 Back in 1981 they all took part in the inaugural race of what is now the leading Marathon in the world. In most cases, but definitely not all, they have less hair, less teeth, less ability - however, their driving force, dedication and perseverance is still there. One thing is for certain they are all thirty-eight years older and some might even say thirty-eight years wiser! 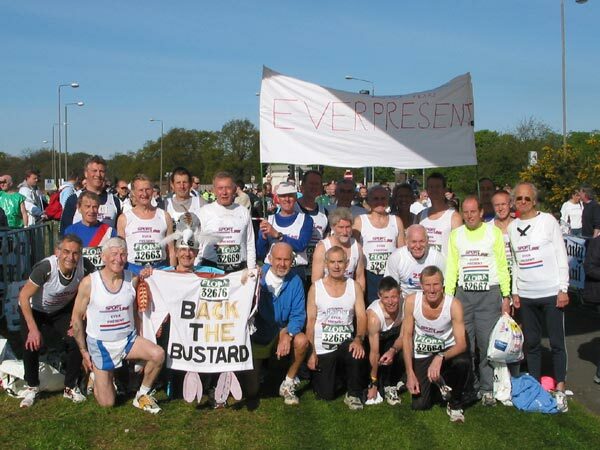 Yes, these 42 runners belong to that worthy group called the "Ever Present". 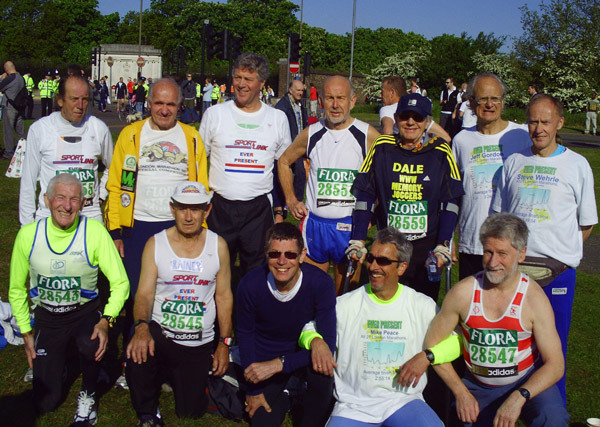 After the fifteenth London Marathon (1995) the group was acknowledged "by the powers that be" and they were awarded with a special commemorative medal, sweatshirt and a guaranteed acceptance for future London's. The original 42 have now been whittled down to 11. 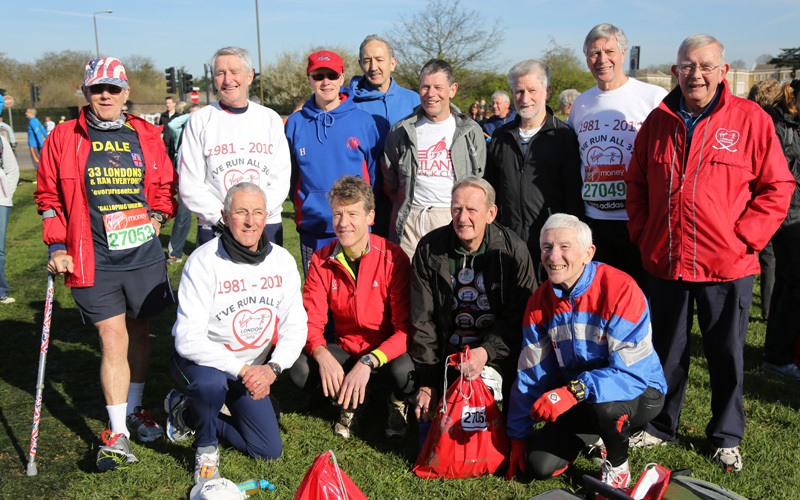 The 11 have completed all thirty-eight London Marathons - some times quicker and sometimes slower. 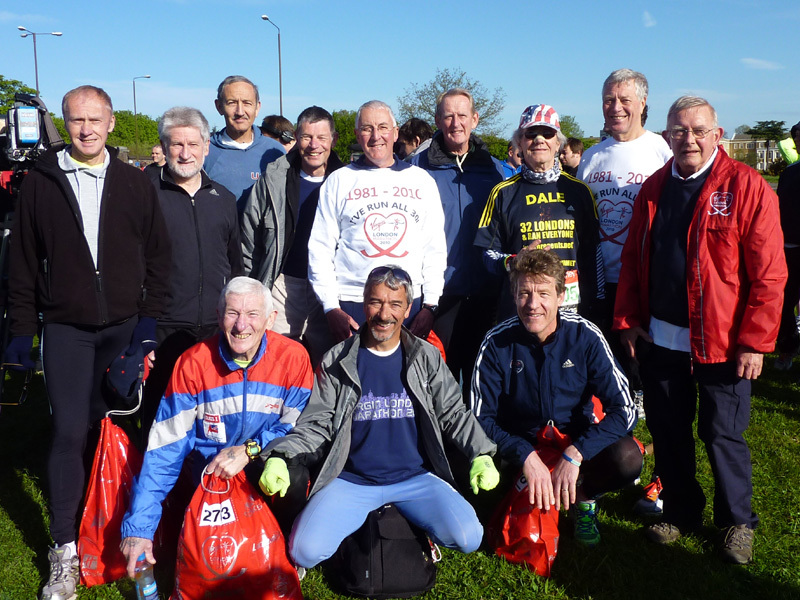 They are all club runners and all except one have PB's inside 3 hours, in some cases well inside! They cover the whole spectrum of today's athletics; they come from all walks of life, different locations and assorted occupations (?) 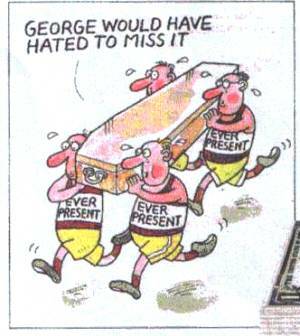 most are now retired!! Please browse the rest of this site to learn more of this unique group of people. 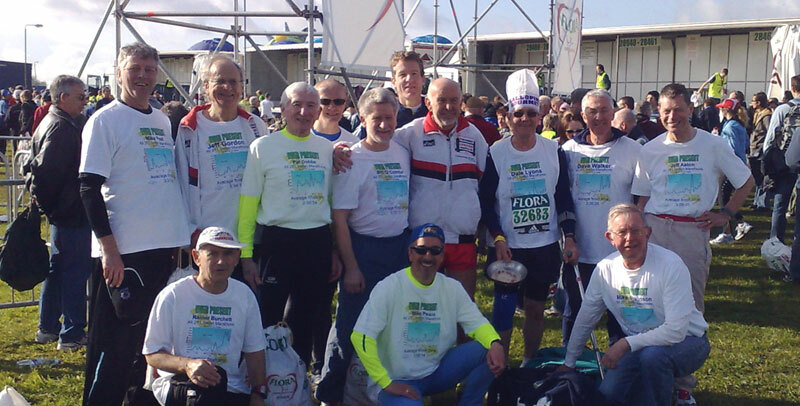 Jeffrey Gordon carried the Olympic Torch on Monday 23 July 2012, the same day as Mike Peel. Remember when Chris Finill ran across America from California to New York in the Fall of 2011 in 79 days 22 hours? You can now view the video of the event. 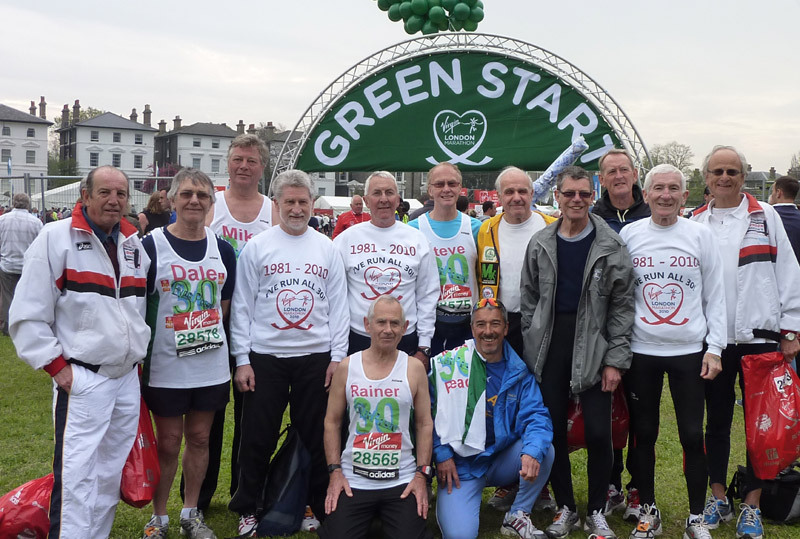 This is the story of 42 marathon runners who were created as the ‘Everpresents’ by the London Marathon in 1995 after they run 15 consecutive Londons.. Now, 34 years later only 14 remain. 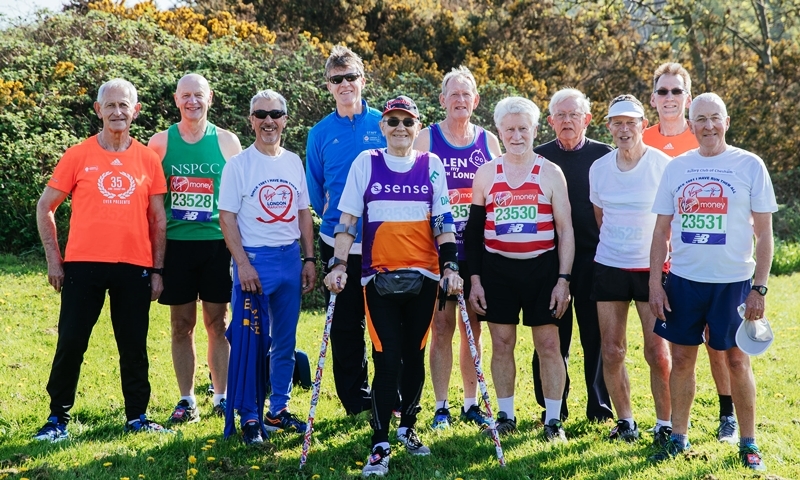 Their story is a testimony to a ‘never say die’ spirit that has sustained them during the thousands of marathons they have run all over the world. 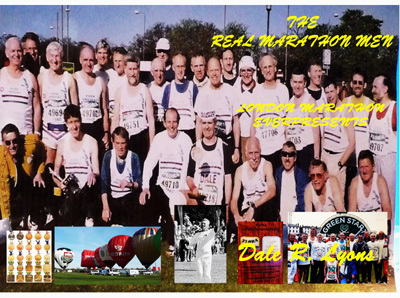 Dale Lyons, one of the last 15, has combined a detailed factual record from his research with many heart warming anecdotes and incredible hardship stories in tracking the Everpresents’ journey since 1981. 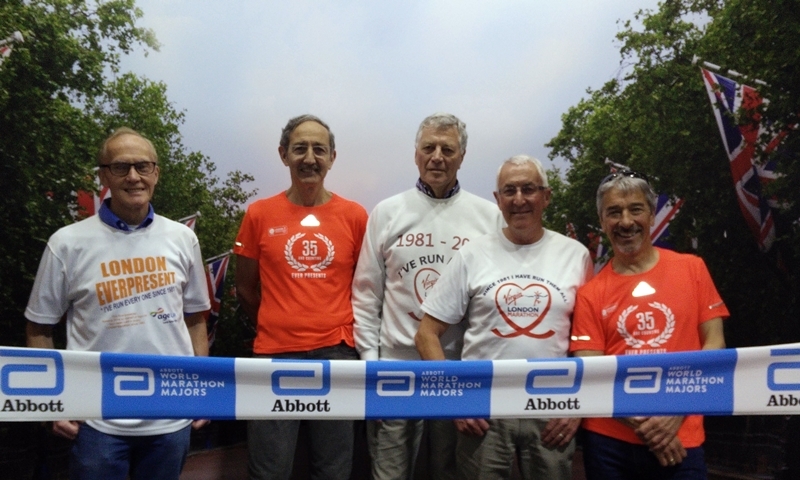 Their triumphs and cruel disappointments, the amazing sums they have raised for countless charities, their incredible running records at home and abroad and their fascinating and colourful lives away from the marathon treadmill makes for absorbing and enlightening reading. 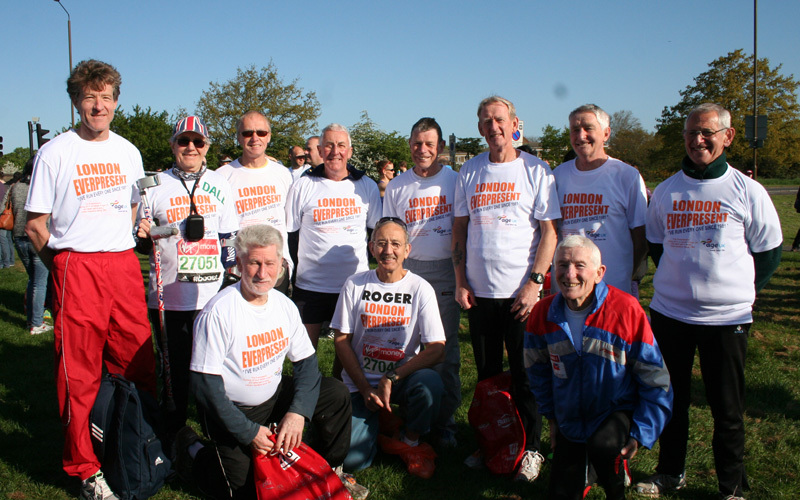 This is a book to honour their commitment to the London, one of the greatest city Marathons and provides a lasting tribute to a rapidly diminishing group ravaged by injury, accident, illness and death. 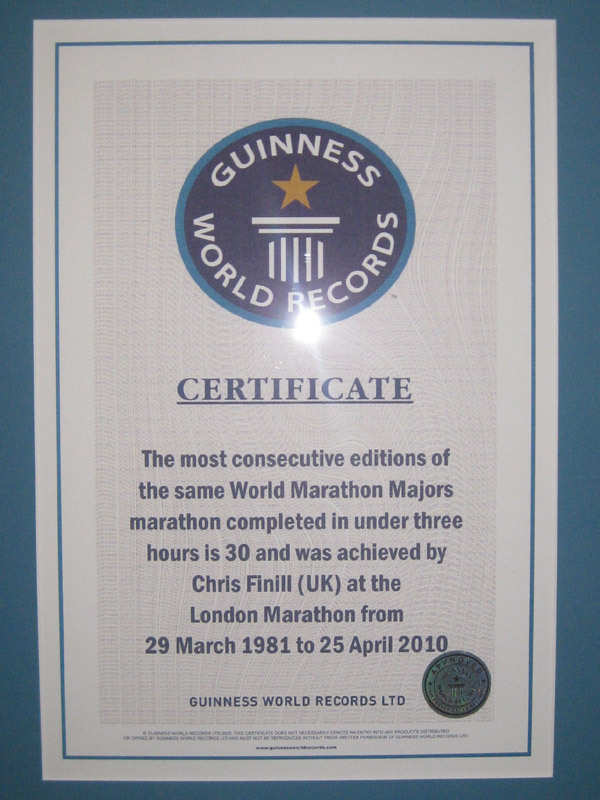 We started off with 42 in 1995 - after the 2015 edition we were down to 12 and we are still 12! Download the PDF of the article on the 12 remaining Ever Presents from the May 2016 issue of Runner's World. Four registered on Thursday and were interviewed by Vicki Barker, a radio reporter for npr & CBS News in the US of A. Both sent in by Dale Lyons. 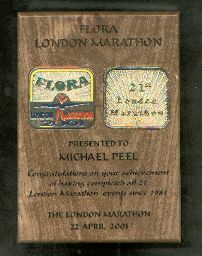 After the 21st the organizers presented each Ever Present with a plaque to commemorate the fact. Sadly John Legge, Orion Harriers, died on Sunday 18 February 2001.